Ephraim Moravian Church. Photo by Len Villano. Each year, the Ephraim Business Council holds a Christmas in the Village celebration the first Saturday in December — this year, Dec. 1. 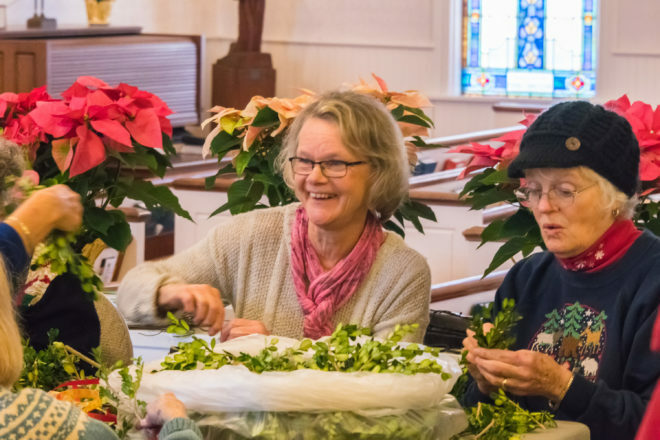 In addition to the open houses, kids’ events and the official lighting of the village Christmas tree, the Ephraim Moravian Church holds a special ADVENTure from 11 am to 2 pm at the church. Visitors can view a display of angels, make their own living wreath or a Christmas Eve candle, eat traditional Moravian treats, hear about Moravian Christmas traditions and take a tour of the church. Moravian stars will be for sale. Tours of the church continue through 4 pm. And don’t miss the enormous Sweets for the Holiday sale at the church — cookies and other baked goods, all decorated for the holidays, will be for sale. The church is located at 9970 Moravia Street, Ephraim.